In order to generate a contextually appropriate behavioral response, an animal must (1) discriminate salient sensory stimuli from background noise, (2) assign valence to the stimuli, (3) integrate the environmental and internal physiological states, and finally (4) generate appropriate behavioral output. The neuronal circuits performing these assessments must be flexible enough to accommodate different states, yet be sufficiently stereotyped to reproduce adaptive behavioral responses. A hallmark of the brain is that a singular input does not always elicit the same output; rather a given input might produce a variety of outputs depending on the current internal or external state of the animal. We have a relatively poor understanding of how this process works, and this is the focus of my research program. There is a vital and growing community of researchers focused on elucidating the neural circuit mechanisms that drive sensory processing and behavioral control. Like many in this field, I make use of a model organism, Drosophila melanogaster. The high-performance behaviors, numerically limited nervous system, and state-of-the-art genetic tools make the fly an excellent model to examine general computational algorithms and neuronal circuitry for transforming sensory inputs to dynamical state-dependent behavioral outputs. My unique contribution comes from the use of behavioral and physiological assays wherein quantitative feedback allows the animal to actively control its sensory experience in real time. My multi-faceted approach combines traditional molecular, genetic, and physiological techniques with cutting-edge ‘virtual reality’ electronic flight simulators, which allow for precise delivery of sensory stimuli and quantitative measure of behavioral output. The use of reliable genetic and optogenetic techniques to activate or inactivate identified neurons or groups of neurons, permit the probing of genes, neurons, neuromodulators, and circuits that coordinate complex behavior. This work has the potential for identifying how well-defined sensory circuits demonstrate both the robustness and flexibility required to generate appropriate behavior in the face of changing internal and external environments. As a graduate student in Piali Sengupta’s lab at Brandeis University, I used quantitative behavioral assays and calcium imaging to identify genes, neurons, and circuits involved in thermotaxis behavior of C. elegans. During my graduate work, I identified a molecule that modulates long-term thermotaxis behavioral plasticity, a multi-modal olfactory neuron that also responds to temperature, and the role of cGMP in setting the thermal operating range of the primary thermosensory neuron pair. As a postdoctoral fellow in Mark Frye’s lab at UCLA and now in my own lab, I continued to investigate the way in which an organism interacts with its environment to generate an appropriate behavioral output. This work explores how stimulus state (valence) and behavioral state (walking vs. flying) affect the behavioral transformation of sensory information. 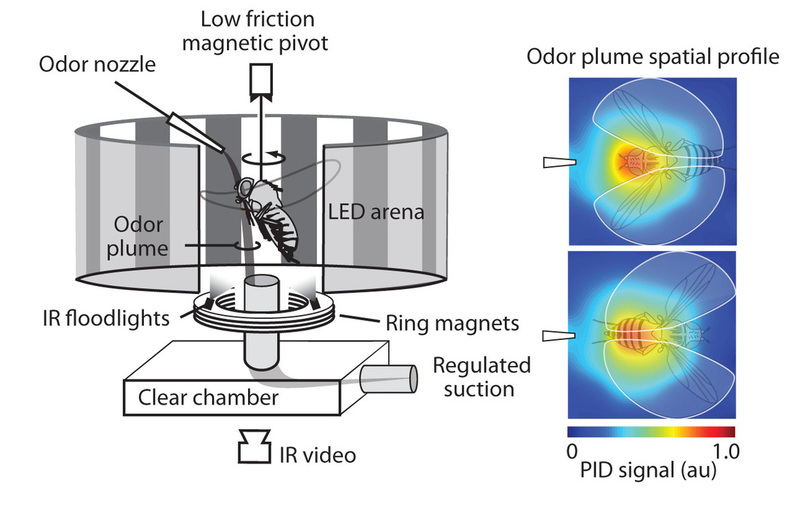 I make use of two sophisticated behavioral assays for olfactory behavior: a magnetic arena in which a tethered fly can actively rotate within a spatially discrete odor plume against the backdrop of a fixed electronic visual display (Figure 1) and a second system in which a rigidly tethered fly within a fixed odor plume can actively steer the visual panorama . These ‘virtual reality’ visual and olfactory analysis systems allow for precise delivery of multiple stimuli simultaneously and quantitative measures of behavioral performance from wild-type and genetically altered animals. Major findings from my postdoctoral work are summarized below. Figure 1 (left panel): A fly is tethered to a pin and suspended in a magnetic tether arena where it can freely rotate in the yaw plane. Panels of light emitting diodes surround the arena and display high contrast stationary and moving visual patterns (not shown) used to orient each fly in a standard starting orientation and provide visual feedback during self-motion. The odor port at 0° delivers a narrow stream of odor (indicated in green) that flows over the fly’s head and is drawn downward and away by a vacuum through the aperture of the ring magnet. The angular heading of the fly is tracked by infrared video. (right panel): The spatial cross-section of the plume, at the horizontal plane of the antennae, was measured for ethanol tracer with a miniature-photoionization detector, averaged over 11 repeated measurements across a 9x9 grid, smoothed with piecewise linear interpolation, normalized to the maximum ionization amplitude, and mapped onto a standard color scale (blue = 0, red = 1) (Wasserman et al., 2013 Current Biology). ​The behavioral state (walking vs. flying) of the fly alters the valance it assigns an olfactory stimulus. Carbon dioxide (CO2) has long been known to act as an attractive host-identifying odor to mosquitoes but somewhat surprisingly, has always yielded an aversive response from D. melanogaster. To date, all experiments investigating the response of D. melanogaster to CO2 have been performed using walking flies. I examined the in-flight response of fruit flies to CO2 and showed that while flies avoid CO2 on foot, they seek out and track a CO2 plume in flight. Additionally, I have shown that in-flight attraction to CO2 requires recruitment of odor and acid sensing pathways that gain sensitivity to CO2 in-flight via increased levels of octopamine in the fly brain (Wasserman et al., 2013 Current Biology). I am currently elucidating the molecular and circuit mechanisms by which the valence of CO2 switches in a behavioral state-dependent manner using genetic, behavioral, and calcium imaging techniques. Figure 3. CO2is an attractive stimulus to flies in flight. Tethered wild-type (WT) flies track apple cider vinegar (vinegar, left panel) and carbon dioxide (CO2, right panel). 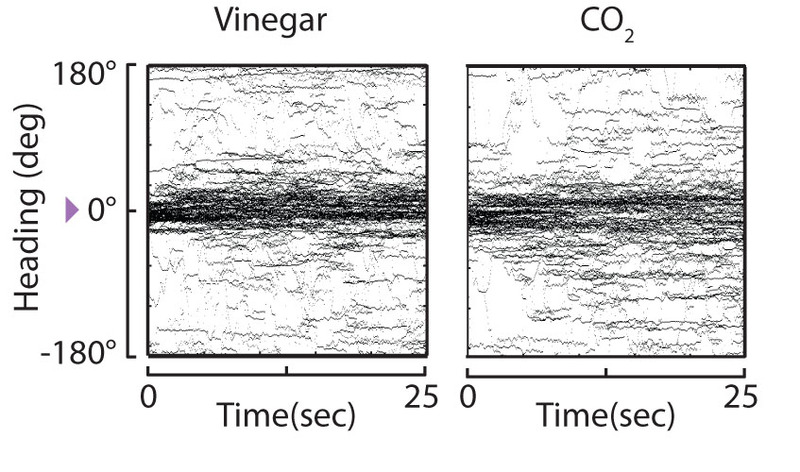 Within-subjects design was used, heading trajectories of all individuals are plotted for a continuous odor plume of vinegar, n = 87 trials and CO2, n = 78 trials. Heading distributions are not significantly different from each other (Kolmogorov–Smirnov, P=0.9448) (Wasserman et al., 2013 Current Biology). Figure 4. Odor modulates Hx activity. (A) Schematic of LED arena display and odor delivery within the imaging apparatus. (B) Intracellular calcium responses to visual motion by Hx neurons expressing GCaMP6m. Mean ∆F/F ± 1 SEM is shown. * p < 0.05, rank-sum test on peak response amplitude compared between epoch one (prior to odor stimulation) and each following epoch, n = 13 animals.